↑ The Transitional Constitution of the Republic of South Sudan, 2011. Government of South Sudan. بازیابی در 12 July 2011. Part One, 6(2). 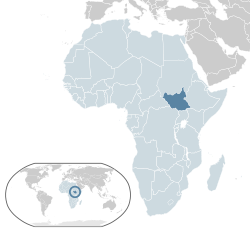 «English shall be the official working language in the Republic of South Sudan». ↑ At a Glance. Official portal. Government of Southern Sudan (12 July 2011). بازیابی در 2011-07-24.